Nestled in an oasis of lush tropical palms and a championship golf course nearby, this family-friendly resort provides the perfect setting for fun in the sun. An eco-zone runs through the middle of the hotel, pristinely separating the main hotel from the lovely beach and pool areas where guests can enjoy a variety of sparkling pools, a Flintstones’ Land™ fun park for kids, specialty restaurants, unique bars and a wide selection of water sports and activities. Hotel Deposit Requirements A credit card imprint or cash deposit is required at time of check-in for telephone and incidental charges. Hotel Spring Break Policy While this hotel strongly discourages spring breakers, it cannot guarantee a spring-break-free environment. Room Taxes Included in vacation price. Service Charges Included in vacation price. Minimum check-in age is 18 year round. All rooms include air conditioning, ceiling fan, private balcony or terrace, private bathroom with amenities, hairdryer, mini-bar, cable television, direct dial telephone, safety deposit box (fees may apply), wireless internet access in select areas (fees may apply and is subject to availability, need to check with the resort). Exception - When 3 adults are booked, no children allowed. Maximum of 2 children through the age of 4 stay free in existing bedding with at least 2 adults. Children ages 5 - 12 are surcharged. All rooms include air conditioning, ceiling fan, private balcony or terrace, private bathroom with amenities, hairdryer, mini-bar, cable television, direct dial telephone, safety deposit box (fees may apply), wireless internet access in select areas (fees may apply and is subject to availability, need to check with the resort). Has a gardenview. Maximum of 2 child through the age of 4 stay free in existing beds with at least 2 adults. Children ages 5 - 12 are surcharged. All rooms include air conditioning, ceiling fan, private balcony or terrace, private bathroom with amenities, hairdryer, mini-bar, cable television, direct dial telephone, safety deposit box (fees may apply), wireless internet access in select areas (fees may apply and is subject to availability, need to check with the resort). Has either a pool or garden view. Occupancy limits - Maximum 2 adults, 3 children, 5 total. Maximum of 3 children through the age of 4 stay free in existing beds with at least 2 adults. Children ages 5 - 12 are surcharged. Exception-no children allowed when 3 adults are booked. Maximum of 2 children through the age of 6 stay free in existing bedding with at least 2 adults. All rooms include air conditioning, ceiling fan, separate living room with balcony or terrace, large bathroom with amenities, in-room Jacuzzi, hairdryer, mini-bar, 2 door fridge, 2 cable television, CD player, direct dial telephone, safety deposit box (fees may apply), wireless internet access in select areas (fees may apply and is subject to availability, need to check with the resort). Has either a pool or garden view. *Access to 'The Gabi Club' a large lagoon style pool with Bali beds and sanded beach style solarium area and restaurant for A La Carte breakfast, lunch and dinner, Pool snack bar, nightly entertainment and bar service. All rooms include air conditioning, ceiling fan, private balcony or terrace, private bathroom with Royal Service amenities, Royal Service room service, Royal Service features, room amenities such as bathrobe and slippers and daily turn down service, hairdryer, mini-bar, cable television, direct dial telephone, safety deposit box (fees may apply), wireless internet access in select areas (fees may apply and is subject to availability, need to check with the resort). Has either a Gabi Club Pool or garden view. All rooms include air conditioning, ceiling fan, separate living room with balcony or terrace, private bathroom with amenities, in-room Jacuzzi, hairdryer, mini-bar, cable television, CD player, direct dial telephone, safety deposit box (fees may apply), wireless internet access in select areas (fees may apply and is subject to availability, need to check with the resort). Has either a pool or garden view. Exception-no children allowed when 5 adults are booked. *La Gondola - Continental breakfast, Italian buffet lunch, and midnight snack. *El Turey Grill and La Angora Grill - Beach grill to enjoy a sumptuous beach side international buffet for breakfast, lunch and dinner. *Le Gourmet - International worldwide gourmet specialties. 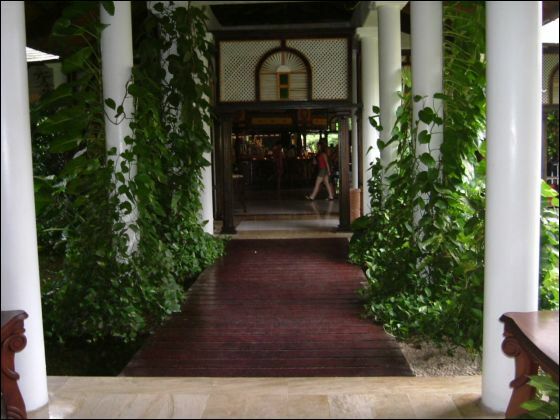 *Ma Maison - Traditional French Style restaurant and services. *Hokkaido - Japanese specialties with Teppanyaki show tables, reservations may be required. *La Pagoda - Asian fusion with strong Thai influence. *Capri - Fish and seafood from Caribbean seas. *American Grill - American cuisine. 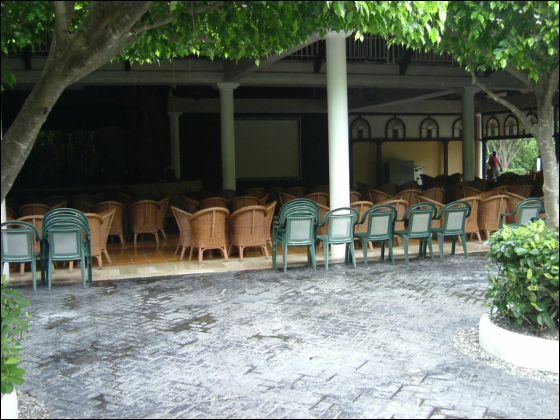 *El Guarapo - Traditional colonial Dominican home-made cuisine. *La Hacienda - Premium traditional Mexican restaurant. *The Gabi Club - A La Carte Contemporary Cuisine. Additional charges apply. Is included for Royal Service guests. Some restaurants may only operate on select schedules. Some restaurants may require reservations and expect appropriate dress. Consult the hotel for hours of operation, reservation policies and dress codes. 14 lounges that include 2 lobby bars, 2 pool bars, 2 beach grill bars, 1 fun Sports Bar pub, 2 hall bars between restaurants, and 1 lounge chill out 'Avenue Bar'. Go back in time and hang out with the modern Stone Age family- Fred, Wilma, Barney, Betty and Dino too. Children become part of the Flintstones family from the moment they arrive. Children will receive a gift at the mini-check in and are registered in one of the clubs, suited for their age. Other amenities: Betty's Kitchen (breakfast and lunch), Yabba-Dabba-Doo Bazaar (gifts and fashion items), RocAdventure and Roca Flash. Baby Rock-for infants and toddlers, 4 months to 4 years, includes a sleeping area, kitchen and bathroom adapted to their size. Childcare is available for babies at an additional fee. Toddlers can participate in fun activities like arts and crafts, fantasy make-up, imaginative games, costumes, music workshops, puzzles, movies, story time, sensory stimulation and more. Bamm-Bamm Club-for children 5-8 years, have their own game room and playground. Kids can participate in stimulating activities, including pool games, camping, T-shirt painting, balloon art, costume and magic workshops. The Cool Club-for older children 9-13 years, features competitive outdoor activities, pool games, camping, workshops and sports. 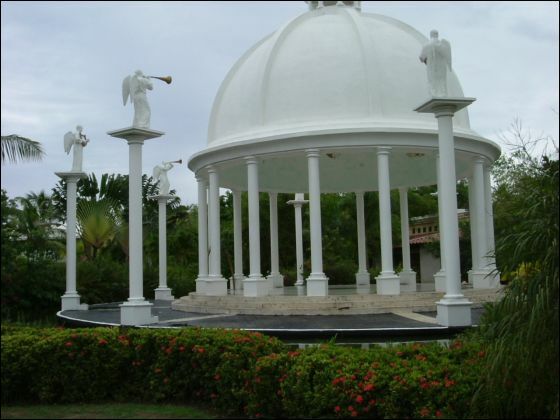 Call Wedding Coordinator at (809) 221 1290 ext 6372 for details. Prior arrangements must be made. Pay locally. We had a wonderful vacation, thanks! It was a bit of a cruel contrast to come back at the beginning of one of the worst snowstorms the area’s ever seen. Too bad we didn’t stay another week. Thanks for helping us arrange a marvelous escape from winter. Here are our reviews! 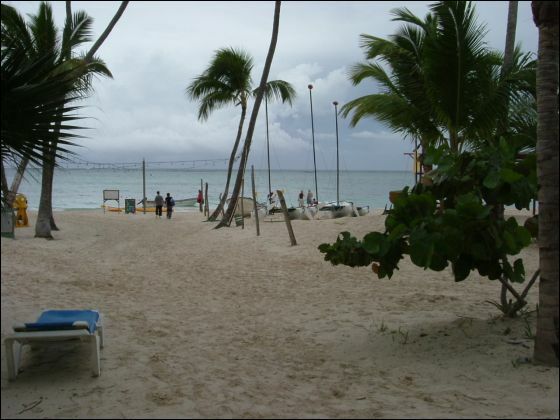 BEACH: Lovely and well-maintained. Good-quality furniture and easy access to food, drink, and comfort facilities. POOL: Clean, spacious, well-maintained. Good-quality furniture and easy access to food, drink, and comfort facilities. SERVICE: Courteous, friendly, and professional. Top-notch. FOOD: Excellent. The meals in the specialty restaurants were particularly good, the service was excellent, and availability of reservations was excellent. ROOM: We received a gratis upgrade to the Jr. Master Suite, with Royal Service. This was a very pleasant surprise (THANKS FOR THAT!). The suite was spacious, well-equipped, and very comfortable. ENTERTAINMENT: The nightly stage shows were fairly mediocre and hokey – but we’ve vacationed in places like this before, so this comes as no surprise. This seems to be the norm for such resorts. There was live musical entertainment every night in the lobby bar, however, that was quite good and enjoyable. The entertainment in the disco is designed for a younger crowd, but the room itself is nicely appointed. I would recommend to the resort that, given the demographic they seem to attract, it would be better if they offered music from the 50s, 60s, 70s, and 80s in the disco until about 11:30, after which they could transition to the hip-hop and techno-type music for the younger crowd. Then the older couples could enjoy the dancing scene in there during their normal entertainment hours, and the younger crowd could enjoy their scene during their more normal entertainment hours. The disco opened at 8 p.m., but was empty until around 11:30 p.m. each night anyway. We would Absolutely RETURN! We had a wonderful time. We are excited to go again, and will definitely use your service again. And are very comfortable referring your outstanding service to others, without reservation! Karin was courteous, efficient, and very helpful. All of our plans came off without a hitch. We told her what we wanted, and she made it happen. Our trip was wonderful. We wanted to stay longer! We were upgraded to Royal Service which was very nice. The service everywhere on the property was 5 star. The food was better than any other AI we have visited. Lastly, the weather was absolutely perfect. I will answer your questions below and may post some of this on your Facebook page. Thanks for everything and we are already talking about where we will go next. Transfers: Arrival, 18 minutes from airport to hotel! 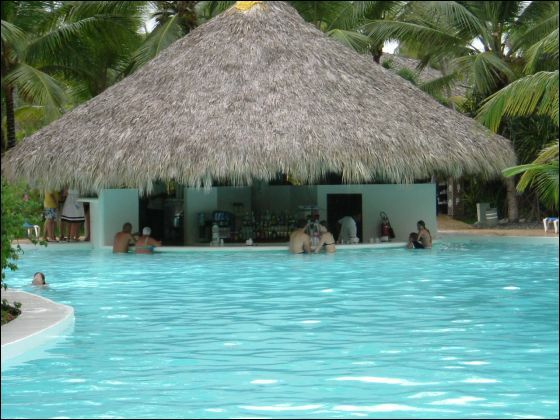 Coming home, one stop at Barcelo Bavaro took 30+ minutes. Beach: The beach was beautiful but the seaweed that everyone complains about really is a problem. You could hardly swim because it was covering your body in the water. However, the beach itself was very nice and we enjoyed the view and breeze, etc. Pool: The pools were nice. We only swam in the Gabi pool but I went to see the others. They are huge! The big pools were pretty empty due to low occupancy the first few days. The Gabi had such focused service, etc which was nice. The only thing I missed were some of the funny pool contests other resorts do. There weren't any of those going on at the Melia. Service: The service was truly 5 star everywhere on this resort. It is funny because the first day another guest at the property was telling us about how the Dominicans hate Americans, the service lacks, etc. We were repeatedly overwhelmed by the service. The birthday party they provided for my husband left me speechless. They brought out about 15 staff members playing island instruments and sang happy birthday in Spanish, then English and then sang another song afterwards. They were all dancing and were pulling us in to the dancing. The cake, which I never rave about, was excellent! Also, they opened bottles of champagne. The feature item on the menu that night was grilled lobster and several of us thought it was the best we ever had anywhere including traveling the Carribean and 5 star restaurants in the US. Food: The food was the best of any AI we have visited. The Mahi mahi, salmon, lobster and shrimp were all excellent. Rooms: The rooms were good. This is an area where I prefer cleanliness to design. They were bug free and above average on cleanliness. Some people would rave about the jacuzzi. My thought was that if I can't drink the tap water I sure don't want to sit in it for 30 minutes. lol. It was pretty though and they made several beautiful presentations out of it during the week. The open bathroom design is terrible. There is no privacy at all. I would never choose that floor plan. We made the best of it and all of the good things far outweighed the bad. Entertainment: Very similar to other AI resorts. 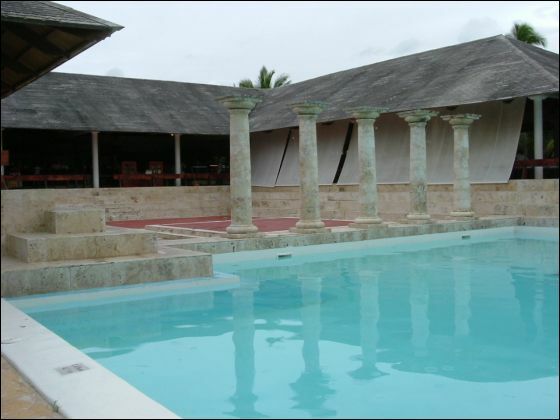 In fact, several were exactly the same theme as the Iberostar in Mexico. They are kind of cheesy really but our mothers enjoyed them and it does give you something to do. Would you return: Yes, but I think it would be hard at this point to book anything less than Royal Service. As you know I have referred you to family and friends. I even gave your website to a couple from NYC that I met at the Melia bar. Thanks. I am sure we will be talking again. Wow! What an amazing trip! You guys sure steered us to the perfect resort! Although the guys nixed the idea of golf (too hot and wanted to stay with the families) everything else was great. The ONLY thing we found irritating was the daily push from the guys trying to sell the vacation timeshares. They approached everyday and carried on prolonged conversations to try to entice us to take "the tour" in exchange for $$ towards spa treatments etc. "Not interested" did not seem to work until my son-in-law got a little rude. Otherwise...this was the PERFECT vacation! Would I return?? Recommend your service??? Absolutely!!!! I'm SO glad Kent suggested we go with you and we will again in the future! Ellen and I are back! We do miss Punta Cana!! We had a great time. I’ll try to give you a review of it all. Transfers- The transfers went fine. VIP did a good job. You were right about the guys at the airport, they swarmed us. 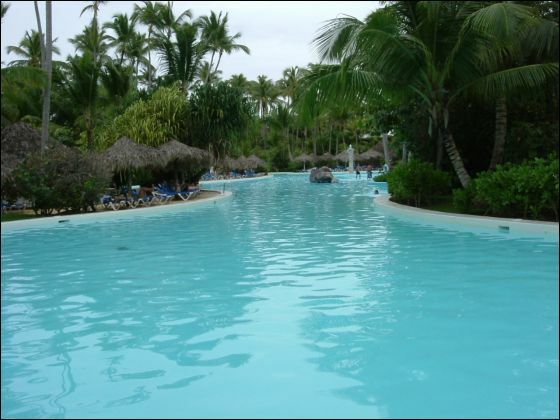 Melia Caribe Tropical Hotel! What a great hotel! It is big but very walkable, with the train if you get tired. We usually walked to dinner and took the train back. Our room was down by the pool/beach area…perfect location. There are 2 beach grills for breakfast and lunch. We stayed in that area during the day and up by the restaurants, bars at night. 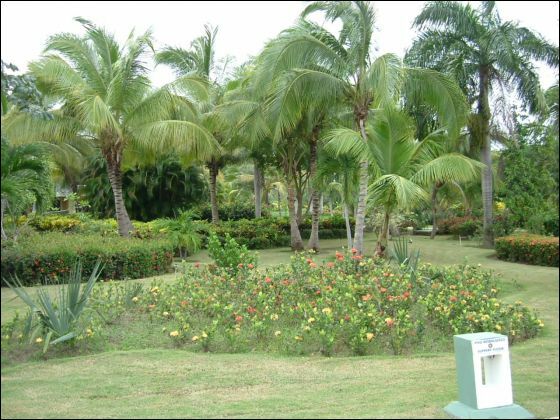 The grounds are gorgeous, so well maintained. The food is incredible, from the buffets to the international restaurant, we didn’t have one bad meal. We ate in every restaurant except French (closed) and Italian (weren’t in the mood). The lobster was even really good (I did not expect that!). I felt like I was fine dining most nights. The staff were very attentive, more so than I usually experience at most resorts (AI or non AI). The maid service was good, not great but nothing to complain about. The rooms were fine, with a nice little sitting area, though the beds a little uncomfortable. The bartenders were fun and engaging and the drinks with as much or little alcohol as you wanted. No one seemed to expect a tip, though we did leave them. The Dominican people were very nice, some of the nicest I’ve met. I was able to practice a lot of my bad Spanish! The pool was huge with a nice swim up bar! It was a little chilly the first few days and quite windy. I think we came in at the end of a storm. We could always find pool chairs, one in the shade for Ellen and one in the sun for me. Same thing with beach chairs. The beach was very nice, soft, white sand. The ocean was a bit stirred up so there was a lot of seaweed. That is the one thing I did not like. For most of the time there was seaweed. You could walk down a bit and find some areas without but even there, you’d still find a little drifting in. I wondered if it was from a prior storm and now that a new storm hit, if that storm was involved or is it always so seaweedy there? As for entertainment, it was kind of what you’d expect, with a few nice exceptions. It was entertaining. The casino was also a nice change. The timeshare people weren’t too bad. They seemed to take no for an answer, especially if you kept on walking as you said no! I would definitely go back to this hotel but I would want to know if there’d be a less seaweedy time. Other than that, it was an A+ trip. Thanks for your help. I’ll be talking to you soon to pay the last on the Mexico trip.